Education Costs > How Much Does Boy Scouts Cost? How Much Does Boy Scouts Cost? The Boy Scouts of America aims at giving young men the knowledge, skills, and life lessons that will eventually help them as they take the necessary path to become adults. Armed with these goals, the organization offers a variety of activities that will not only help kids mature, but will educate them and offer leadership opportunities that will help them in the future. There is also a deep sense of friendship that is developed during activities held by the organization. From the 1900s until not, the Boy Scouts of America still upholds the organization’s ideals and virtues. The cost to join the Boy Scouts will depend on your local chapter and where you live. More than likely, this annual fee will be in the $25 to $115 range. However, most of the bigger expenses are for the uniform and other fees needed for the necessary activities and endeavors that the scouts will venture into. The good thing, however, is that most units schedule fundraisers to help the Boy Scouts earn money for events to help alleviate these costs. On BabyCenter.com, members talked about what they had paid talked about what they had paid. Depending on their local chapter, the costs were inside the $30 to $75 per year range, with some paying $15 per month to remain active. In Sunland, California, for instance, they list that their annual fee is $75, and this fee will include the registration fee, Boys Life magazine subscription, and the remainder will go toward the troop for books, training, patches and more. As has been mentioned, the fee to register for the organization is only inclusive for the registration itself. The said amount will make you eligible to be a member of the organization and that’s it. This means that you are allowed access to many events and activities that are organized by the Boy Scout Council you join. When joining Boy Scouts, you can do it by just talking to an existing Boy Scouts chapter or council in the area. For easier access, you can log onto the official website of the Boy Scouts of America’s National Council and click the “Join Scouting” button. You can then find a local council in your area after you enter your zip code. This will give you the opportunity to look for a local pack meeting where you can find a pack leader which will help you formally start out and complete your registration. Uniform and camping equipment will often be a must for every Boy Scout. For the uniform alone, expect to spend $100 to $140. This fee range would include the shirt, neckerchief, slide, shoulder loops, cap, belt, zip-off pants, socks and the handbook. Boyscouttrail.com, for instance, has a complete list of the average price for what is needed for a complete Boy Scout uniform. Camping equipment, on the other hand, will include the backpack, sleeping bag and boots, to name a few. However, most units usually have pre-owned clothing or gear that a new scout can use. Boy Scouts would not be complete without camping trips, and as expected, there are costs associated with these trips. A particular unit in California, for example, charges $25 for a one-night trip and $35 for two-night trips. In addition, extra costs may be charged if there are entry/tour fees or extra travel costs (e.g., ferry, bus, train, plane or distant destinations). Although this is optional, most Boy Scout units recommend subscribing to the circulation magazine as this will update all scouts about the important activities of the organization nationwide. Subscription can range from $12 to $16, depending on the unit. Some units, from what we researched, may charge a mandatory popcorn fee. Like the Girl Scout cookies, Boy Scouts will sell popcorn to raise money for upcoming events. This fee, if initiated, is often in the $75 range. Adult leaders, if they were to join, would often have to pay an additional $20 to $40 per year. A boy who participates in scouting can expect to have a lot of fun, work hard, learn a lot and grow both physically and mentally. Citizenship is not required for youth or adult members. Thus, one can join even if he is not a U.S. citizen. 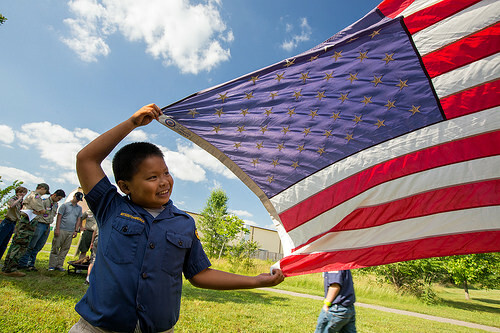 Cub Scouts and Boy Scouts are both programs offered by the Boy Scouts of America. However, the two are not the same. Cub Scouting is designed for boys in the first through fifth grades (about 7 to 10 years of age) while Boy Scouting is for kids older than 10. In addition, Cub Scouting is a family-oriented program designed specifically to address the needs of younger boys. Unfortunately, you cannot change fees associated with registration and unit dues. However, you can save money on uniforms and other equipment. You can let your son use a uniform formerly used by a Boy Scout neighbor or an older brother, perhaps. If you opt to buy, purchase only the minimum required items in your troop, or better yet, buy used Boy Scout items either online or through an existing member. Additionally, look for “Uniform Exchange” within your troop or district. This program lets you pick up or drop off uniforms. Adding a second Scout to the same pack can often drop the costs. Many packs will waive the fee if a Scout sells a certain amount of popcorn. For example, if you were to sell $200 to $300 worth of popcorn in a year, then the fees may be waived. For just the scout $75 yearly fee, plus $90 something for uniform, plus $15 to $50 to camp. $350 for 1 week of summer camp. If you are going to be a Leader $60 yearly fee, plus $140 something for uniform, plus $15 to $50 to camp. $75 for 1 week of summer camp. They(BSA)love to compare cost to youth sports, however with lets say L.L.Baseball it cost about $125 for Registration and uniform shirt and hat. Paints $15 Bat $50 and glove $50. But you don’t have to pay every time you play a game. With scouts you pay every time you want to goto camp or an event put on by the BSA. Scouting is O.K. but don’t let them pull the wool over your eyes.